works with sound; officially registered as composer & producer in Vienna but finds himself permanently in transit. produced a wide variety of works ranging from studio-productions to live-performances, film-scores, theater-productions, installations and radio-plays. 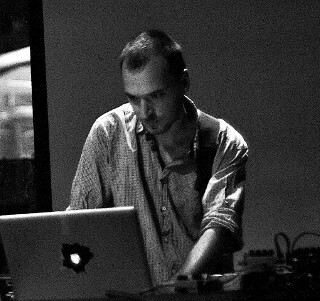 Over the years Kutin has gained a great deal of expertise in the art of field recordings, often realising projects in remote regions of the world. With an affinity for extreme situations and conditions, he continues to push his recording techniques to their limits, whether capturing the sound of sand movement in deserts or the crackling of salt crystals when contracting. His field-works have led him through steep mountain ranges, jungles, deserts, into glacier gaps, volcanoes, protest marches, war zones, and even into prison; experiencing sound as a physical and psychological force creates a sense of urgency that leads to a better understanding of the material and a clearer idea of the orchestration and arrangements. Kutin’s approaches and aesthetics towards ‚capturing and editing sound‘ have become more and more interesting not only within the limited field of the music-industry (studio & stage) but also for film and theater directors who place a strong focus on the sound aesthetics of their productions; among them are international award-winning directors such as Nikolaus Geyrhalter, Billy Roisz, Daniel Hösl (Tiger Award @ Rotterdam Film Festival 2013) or Fritz Ofner. Kutin’s works and collaborations have been presented and performed at various international festivals. His collaborations reach far beyond the fields of music and composition; not only into other forms of art, but also investigative journalism or documentation.